In May 2012 we took our daughter (adult) and got a Brit Rail Party pass first class. It was super. Riding the train is very easy. First class was very nice. We always had a seat and space for luggage and enjoyed the snacks carts when they came around. We also took advantage of pre-buying Oyster Cards for London and the airport rail pass to get to London from Heathrow. So less stressful when you pre-order and have everything before you even land in England (and it is more cost effective)! 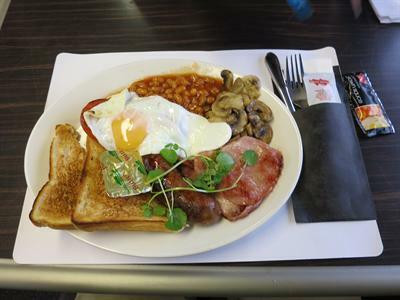 We had a WONDERFUL breakfast when we took the train from London to St Erth. Love riding the train! My husband and I are headed there again in June and hope to win passes! I planned a trip to England last year to visit relatives. I did it all in one morning at the computer. Looked up times for trains, stations, mapped out our routes and then bought my rail pass. SO EASY. Everyone should do this. I cant begin to tell you how much money I saved with the rail pass. Also, EVERY train was on time and the schedule was fantastic. Everyone should travel by rail in Europe, especially the UK. This is probably the 20th time I've had a rail pass. Purchased 15 days of first-class train travel during 2 month U.K. stay in summer 2012 - worth every cent! No worries about catching specific trains, finding a seat, missing connections. Best part - no stress from navigating a car, getting stuck in traffic jams, etc. More efficient if you stay near a central train station. Access to out-of-the-way places is limited and takes longer, but travel to/from city centres like York, Liverpool, Birmingham, etc. becomes a relaxing pleasure. I recouped this investment in just three trips to London which, if purchased on the day of travel, would have cost hundreds of dollars (due to exchange rate). First-class service was hit and miss on non-London journeys, but consistently good on commuter trains to/from London. First-class seats always plentiful, even during the Olympic summer in London. Worth trimming your budget in other places! Highly recommend the Britrail pass for short or long term U.K. stays. Trains run frequently, were always on time, clean and comfortable. Timing alwaysworked well for making connections. The views of countryside, towns and cities we passed through were amazing. Having the pass let us board trains without having to stop to buy tickets and meant we could easily get on and off anywhere that looked interesting. It was nice to be among people who live there, as opposed to isolated in a car (trying to drive on the opposite side of the road), or on a tour bus. In March of 2012, I traveled on BritRail for the first time in almost thirty years, on a Senior Flex pass. I rode from Lytham-St. Anne to York, York to London, and London to Exeter. On each branch I encountered courteous and helpful staff, clean trains and stations, and accurate timetables - everything that could reduce the stress for an old geezer traveling alone. And seeing England by rail is a wonderful experience anyway. I have always preferred train travel and I was pleasantly surprised by the efficiency of BritRail, and the value and convenience of the flex passes. I expect to return to England sometime in 2013, this time with my wife, and we are definitely planning to make BritRail a major part of our travel plans. In the fall of 2012 we used the 8 day Britrail England Pass to travel round trip starting from Gatwick Airport, to Liverpool, Blackpool, Birmingham, London, then Newcastle and back to London. Train times were never an issue nor was transferring. Finding seats was always easy and comfort was never a problem. Travelling by train takes all the complications out of travelling Europe. The savings over multiple point to point tickets was very significant. Why travel within the UK in any other way? The BritRail pass has proven to be a fantastic value and a godsend whenever I visit the UK. It is a fantastic value compared to any other mode of public transport and allows the flexibility to travel when and where I want. I have to visit many different cities as I am an Educational Consultant and the BritRail Pass allows me a cheap and flexible way of traveling at a moments notice to many locations in the UK. As an American I marvel at the British Rail network and am thrilled to have the opportunity to travel with freedom on the BritRail Pass.I see no reason why an American visiting the UK should spend vast amounts of money on a variety of transport options when the rail networks can get you where you want to be quickly and in comfort.Thanks BritRail. The system of having to validate the pass at a ticket office before itsl first use is very inconvenient. At Paddington there was a long queue at the ticket office and by the time my pass was stamped I had not only missed my train but was delayed by a huge holdup due to a death on the line and the consequent close-down of all services. Obviously that was exceptional, but I cannot see the need for the pass to be stamped at a ticket office before use. Really appreciated the help and advice from the office personnel, and the value of the promotional extra day of travel. My friends and I did the Coast to Coast walk in June 2012. Our Britrail Flexipass made it so easy to get to the North west coast of England from London and then 17 days later we were able to use it again. We made York our base for a while and the impromptu side excursions to other places like Liverpool to see the Beatles exhibition was made so easy with the Flexipass. The ticketing offices and conductors all knew about this pass. There was never a minute of trouble. We saved many many pounds that we were able to spend in so many other ways. We will definitely buy another pass for our next visit in 2014.